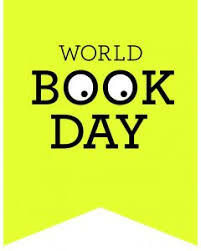 The Library organises and runs a BOOK WEEK each year around the date of World Book Day. This event always involves a day’s author visit – which is a very inclusive event as she/he gives talks to each year group in KS3 (years 7, 8 and 9). This year we liaised with the P.E. dept. to bring in author Dan Freedman for the day. Dan enthused students about his football-themed fiction books, giving fascinating insights into his life as a sports journalist. He also brought along a friend who is a well-regarded youth coach for football to run football skills coaching sessions for talented footballers in years 7-10. Other events in Book Weeks have included ‘Guess-the-character’ competitions in which staff dress up as a book character for the day and students have to guess which characters they all are, and a Book-themed Treasure Hunt around the school. Each year points earned in the various competitions plus points for books read in the reading challenge (see below) are added up with the highest scoring tutor group for each year group gaining the accolade of Book Week Champions. Each year the Library organises a Reading Challenge for the Spring term starting in January and lasting up to the end of Book Week. Each year there is a different theme. Students earn certificates and fun prizes for each level of the challenge they complete.